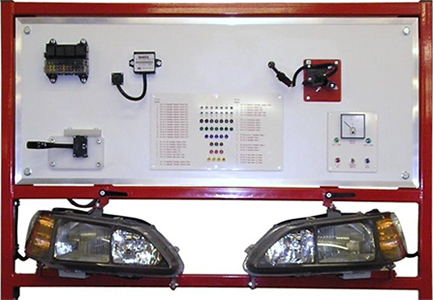 Fully operational High Intensity Discharge (HID) lighting system Trainer, manufactured using components from original vehicle build. Complete with HID headlights, headlight adjuster control unit, level sensor, multifunction switch, fuse box and relays, ignition switch and ammeter. Board mounted in a vertical frame with castors.